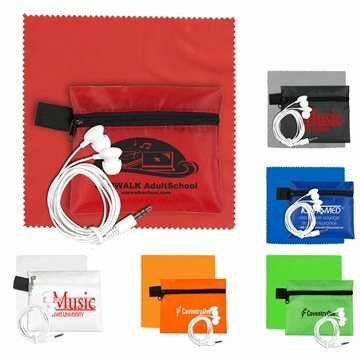 Includes white headphone earphones and matching color 6"x6" Microfiber Cleaning Cloth and matching color zipper pouch. Quality of the product and how it was packaged were great. Perfect item!! Great quality and price. Great product. The conference participants were impressed with all the items we'd purchased from Anypromo.